We can’t really know what being moral is, until we know what being immoral is. The greater degree of accuracy in understanding what is immoral, the greater degree of accuracy we have in understanding what is moral. Without understanding even one thing (one action, one behavior) as immoral, then the default worldview and selfview that will be generated is that everything is moral. This is essentially a position of amorality, where the recognition of a distinction between moral and immoral actions or behaviors are not engaged in, not developed, or even possible to be understood for various reasons. Some may be due to a limitation in the capacities of consciousness from brain damage, cognitive birth defects that create mental retardation, or being a nonhuman animal, will mostly qualify a being for an amoral living that can’t understand concepts such as morality. And some are limitations or restrictions imposed through indoctrination and conditioning into falsity and a lack of quality truth to enlighten our understanding of ourselves and reality. If you can’t see immorality or wrong, then there you can’t see how you are being immoral or wrong. The whole struggle of humanity in history demonstrates this almost “eternal” battle we are waging in consciousness: the struggle to understand and be more moral. Understanding greater depths of morality through caring and seeking out moral truth, is part of the great work all humans have a responsibility to. It’s at the core of who we are. Consciousness highest order function is to become “with-knowledge” of conscience. Those words have the exact same etymology root. Consciousness is to be “with-knowledge“. Conscience is more specifically to “be mutually aware“. Mutually aware of what? Of each other, our interactions, and the consequences to our actions with others living around us. That’s why conscience has to do with knowing right from wrong, moral from immoral, good from evil. It’s about a mutual understanding of our actions affecting others in reality, not simply common-knowledge of knowledge, but common-sense knowledge about how to live with others to optimize cooperate survival and creative potentials. Conscience has two components, and is a word that derives from the Greek syneidesis, which means knowledge of the past actions, i.e. the moral failures and successes in our lives as we try to cooperate and be more moral. The knowledge of the past is used to understand where we have come from, in order to better understand where we can go into creating the future. 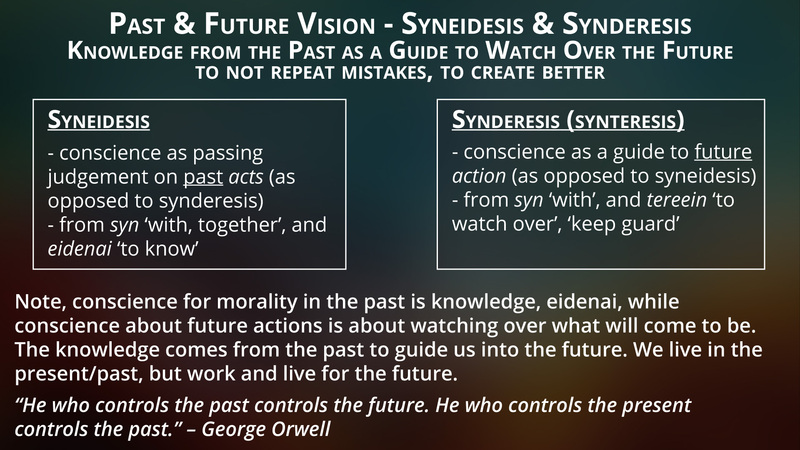 The future component of conscience is called synderesis which is about how to act into the future, guided by being with-knowledge (consciousness) of conscience as past actions that are right or wrong. We must learn about the past, in order to not repeat the same mistakes. Knowledge and vision of the past provides a guide and foresight to improve the future. This is the power to transcend the biological, environmental and social conditioning/programming. Moral Truth, conscience, from consciousness, is the internal pro-vision (providence), the guardian, watcher and guide (synderesis) to our future actions. This is engaging in the transcendental power of consciousness to create a new and better reality into the future. We haven’t done something yet. We think about what we are going to do, go into the future in consciousness (based on the present and past existence), and then we will bring that future potential into the now and act upon that conception of the future we created in our mind’s eye. We create the future based on our actions. Actions are what create the human world. In Ancient Egypt, there was the concept of heka, which is magic. I have talked about the real magic of language and the power of consciousness to alter, affect, change and create into reality in a 10 part series. Heka is to employ, use or engage in the power or energy within us: the power of our consciousness, psyche, “soul”, “spirit”, and conscience of our moral nature and moral essence that determines the quality and condition of our lives. Moral Truth was the other all-pervading foundational concept of Ancient Kemet, called maat, or personified as the “goddess” Maat. Truth, right, morality, justice, etc., are at the foundation for our lives and higher living, yet few recognize and champion for the importance of moral truth in life. It seems to be taken for granted when it’s importance is not understood. But getting back to explaining why we can’t know what really is moral until we know what is immoral. People who used to engage in slavery, accepted that slavery was good and moral. Until they recognize the immorality of their behavior, they were not willing to change. This is what I talk about in terms of the falsity of our way of life, and the conditioning and social engineering of our society to impose falsity as our way of life. Each new human that is born into the false way of life that currently exists will get conditioned into that false way of life and accept it as the default “good” and “ordered” way to live. To recognize and admit to the insanity and immorality of our way of life is hard to do. We are attached to the worldview of how we think reality operates, and our selfview is attached to that. Letting go of falsity we identify with as our way of life takes psychological work that few have developed the capacity to do. Back in the overt and outright slavery days, that was the condition in society that was imposed on people and programmed them to accept as “good”, “ordered” and a “moral” way of life. They didn’t have knowledge of what immorality was, so they kept engaging in immorality. They could not be more moral until they learned what being immoral was. Right now, there are things people are doing, that they think are “good”, “ordered” and “moral”. They don’t know the immorality of their actions, so they think that they are not doing anything wrong or immoral. Just as it was in the times of slavery, so it is now, where people are ignorant of what morality is in varying degrees, and do not dig deeper in understanding the depth of morality of their behaviors. There is still a lot more enslavement going on that people don’t want to look at, from overt to covert slavery. We all support violence and immorality through our support of statism, yet most don’t even realize this. That’s just one example of a lack of deeper moral understanding that exists in most consciousnesses. Denial is strong in many who refuse to acknowledge the current condition for what it is and how they participate in creating evil, immorality, and wrong into the world, just like it was with people who were engaged in and supported overt slavery refused to see themselves in the mirror honestly. There is also more to understand about morality than simply being a non-statist either, yet many “anarchists” will deny other greater moral understanding because they don’t want to face the reality of the current condition that they are involved in creating either. The way to moral truth, is through an apophatic negation of understanding what not to do. Understanding the range and totality of the smaller subset of actions as immoral, allows everything else to default to being immoral, whether it’s neutral or active creation of moral behavior. Learning about immorality in our lives or in the world (syneidesis) will lead to more morality as we learn from our own and other’s mistakes to better guide our actions in the future (synderesis). Moral truth is the key to the quality and condition of our lives, and to reach higher, truer and realer (maa) potential living. Knowledge from the past is our guide to watch over the future. Care for, seek, accept, embrace, embody, live and speak moral truth in life!